I'm looking for a source for one or a few 1-bit black-or-white bitmapped fonts used in the past, available in a set of sizes. Current incarnations might be available for large LED displays, but those may work best for point LEDs rather than square filled pixels, and ideally these would be something recognizable by some as having historical aspects. Should be available in a range of sizes. 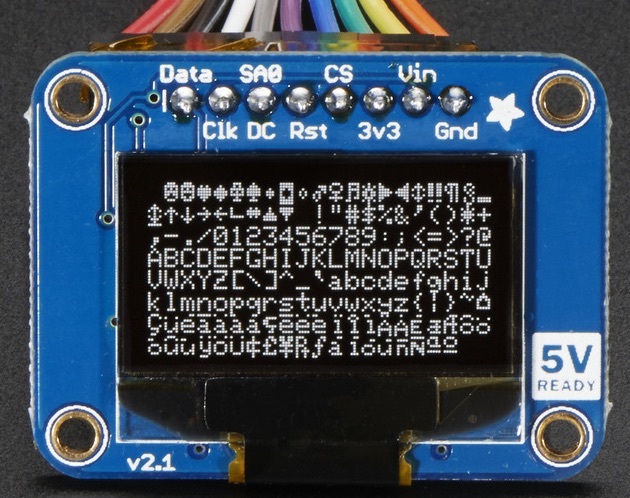 The application is a small 128x64 pixel OLED display. I currently use Python's PIL which has a "default" font that is just too small for this display. I can also use it to read TrueType fonts, then I down-convert to gray scale then use a threshold to get 1-bit, but it looks ragged. See here and here but here I'm not asking for Chinese characters; even the original ASCII would be helpful. Example of a 1-bit binary OLED display (128x64 pixels) cropped from this image from the AdaFruit Page Monochrome 0.96" 128x64 OLED graphic display, Product ID: 326. These days even black-and-white fonts are displayed using grayscale or even color. Zoomed screenshots from my laptop showing that what looks black-and-white isn't. Trying to post-process these back to binary by thresholding can lead to rough edges and strange looking characters. Looks positively awesome to me. I started by looking for IBM MDA - the classic 9x14 font, and I found this site. License is Creative Commons Attribution-ShareAlike 4.0. I've downloaded the file. Zip contains all the fonts ready to install in Windows. You should be able to convert it to whatever you need, including actual bitmaps - I've done that in the past, though not lately. This includes dozens of fonts - IBM CGA/EGA/MDA/VGA, ATI, Tandy, Phoenix, etc. -misc-fixed-* X11 font "family" matches all your criteria - it originated sometime in the 1980s, thus it can be considered retro or vintage, is distributed public domain, comes in several sizes (5x7 seems appropriate for a small LCD display), it is still developped and as a consequence has a reasonable beyond-Latin1 repertoire, the BDF (or PCF) format is easily parsed if necessary, and they are part of X11 core, therefore present in almost all Linux/BSD distributions and still maintained. Typefaces are not subject to copyright, at least in the US, so you can do what you want (again, in the US). Bitmapped representations are typefaces. This is in contrast to "fonts" (such as TrueType), which are considered software that render typefaces. https://en.wikipedia.org/wiki/Intellectual_property_protection_of_typefaces discusses the different aspects in different countries. These days even black-and-white fonts are displayed using grayscale or even color. Zoomed screenshots from my laptop showing that what looks black-and-white isn't. These could be artifacts of you underlying display technology, especially for fonts, particularly today with modern high resolution screens. If you happened to have an actual bitmap of pixels in B&W that Just So Happen to look like letters, you would not necessarily be seeing those artifacts. Depends on how the graphics are actually rendered by the underlying software. Damien Guard's series of articles starting with Typography in 8 bits: System fonts has versions of almost all of the old system fonts you might remember. If you don't mind digging about in ROM images, there are rather more than one lifetime's worth here: https://github.com/phooky/PROM — the Osbourne 1 font is remarkably pretty. For making true bitmaps from vector fonts, I wouldn't be without otf2bdf. There will be library code for Python to read BDFs, as it's the documented, cross-platform way of describing font bitmaps. Acorn BBC Micro teletext font (aka ‘Mode 7’) - output by the Mullard SAA5050, it's been extended in the Bedstead vector font family. Sun Microsystems's Gallant terminal font - effectively a monospaced Times. Atari ST 8×16 font - used in 640×400 "Jackintosh" mono mode. It might just be a standard DR Gem font, though. The Amstrad CPC bitmap font is detailed in chapter 7 of the user manual. There is an 8x8 bitmap for each ASCII character. The bitmap fonts that come with http://x3270.bgp.nu/documentation-faq.html are licensed under the same MIT-like terms the program is under. Some of them are too large for your application, but there is one that's 8 pixels tall. If you download the source tarfile, it'll have the .bdf fonts inside it. You can probably just grab the Signetics characters that were copied into the Apple II (it was the chargen ROM used in the Apple I), MSX, NEC PC-8000 and countless other computers of that time. Check https://www.mamedev.org/ or http://mess.redump.net/. A third possibility is the Spleen bitmapped font by Frederic Cambus that is the default console font for OpenBSD. You can get it from https://github.com/fcambus/spleen. More information can be found at https://www.cambus.net/spleen-monospaced-bitmap-fonts/.